These might be swapped and be used again! Brief History: James was born in Australia. He never burned or got hot so his mother started to suspect he was a demigod, she knew his father had been Hephaestus but he never warned her he might have any powers. Once he got angry at the age of twelve and his body was engulfed in flames and he was ten inches of the ground she used the foaming machine thing to cool him down and they moved to the U.S. within a week. He moved to a small village in California to a big farm. He lived there for three years with his mother and two satyrs since he refused to go to the Camp. At the age of 16 he left the farm and moved to the Hephaestus Cabin. He visits his mom every month for a week by putting up strong defenses against any monster around the house he is able to keep her safe and when he is there both of them safe. At the house he trains his mother who is still very young, since his age was accelerated by his father, in sword-fighting, archery and all other things using celestrial bronze weapons to make sure she was able to defend herself from monsters. Physical Appearance : James has a strong, tall and muscular built. He stands around the 6'3'' and has a tanned skin which never seems to change colour. His hair is black which he always has spiked up in wild directions. The eyes on his flawless face are just to melt for, red and black mixed flaring through his iris which is sometime when he is saddened turns into an ashy grey. Pearl white teeth always smiling to keep people distracted from the huge scar over his chest reaching from his shoulder going down sideways just past his belly-button scaring people whenever he flashes his muscular chest. This is why he tends to swim with a swimming skin on so he doesn't have to go shirtless. Mostly you can find James in Billabong, Quicksilver or Ripcurl clothes. Mostly then just swimming shorts and a V-Neck shirt, never one which is sleeve-less as this would reveal his terrifying scar. The Scar. This particular scar that runs from his left shoulder down to his right leg but not going lower than the line of his shorts. He got this scar in a fight with a horridious creature created by the almighty Hecate. This is one of the reasons he now avoids any demigod who is a offspring from the Goddess of Magic. Personality: James is a great guy, popular and still talks to everyone to make them feel like they belong. He is always helpful and kind but very shy and doesn't speak and doesn't like being watched or showing-off. Most likely you will find him hidden in the shadows in a corner even though he is popular. Once you get to know James he is amazing, free and strong-willed. He fights for what he believes in and is even more loyal than a dog to it's owner. Once you earned loyalty from James you earn protection and love for the rest of your life. This love can come in any form. He might love you as family, a friend or as his current crush. James doesn't date often, when he does most girl kiss him and run of. He has become wary of them and tends to avoid them at all cost but would rather engage with a girl than an offspring of Hekate'. Fatal Flaw: He has the shortest temper in the world. When someone does something and he warned them not to he gets so mad he might kill them. Plus his scar is a flaw, it disables him in some fighting moves he could normally without it do, although not many. Demigod Ability/Abilities: James is able to create and manipulate fire without hurting or burning himself. He was the equivalent of the 'Human Torch' in that Fantastic 4 movie, he had the same abilities and unfortunately also burned up his clothes and mostly wore a special suit under his clothes. Other than that he is an amazing smith creating the weirdest and most wonderful weapons and defensive items. Hobbies/Talents: Creating weapons is his love and passion, he could do it for days in a row without stopping for anything. Furthermore he likes swimming, he doesn't know why since water is his greatest weakness but he loves the feeling of the water sliding over his skin. Pets: James actually possesses a few creatures he got from Hecate as an apology, these creatures look like tiny blue birds which follow him everywhere flying around him. He is able to draw some power from them which kills them but they rise up again. He barely even does this since the power he draws is unpredictable. Weapons: James has an entire closet full of weapons he had created and uses, no-one is able to use these and all of them have a name and are labelled above the place they are kept. These are the charries I use currently! Brief History: Like Erik, Jacob was born in Tulsa, he lived there for two years until he was send away by his father who loved Erik more than anything because of his demi-god status. He did not know however that also Jacob was a demigod. Nor did he care even if he had known. He was send to an institution in London where he grew up in an orphanage run by a fantastic lady who loved kids. His British accent is very very strong because of this. The lady had quite a shock when Jake broke his leg and it had healed the next morning. A tree outside of the orphanage in the garden was actually a dryad hidden within the core had watched him since he came to London. She loved him because he would sit under the shade of the tree and protect it if someone came near. She knew he was a demigod and had alerted Camp so they send a satyr out to retrieve him and bring him back to the U.S. He lived in the U.S. even since but still visits his old orphanage still run by the same lady. Physical Appearance : Jacob looks nothing like his older brother, Erik. Jacob is built slim and has better agility than the more muscular demigods. He squeezes and bend through and in attacks instead of using muscle and brute strength to attack. He is only 5'8'' and can make any flip or bend humanly possible. Jake' hair is short and blonde with the brightest green eyes you could possibly see. Mostly he spikes his hair up randomly because he is unable to tame his hair. If he doesn't feel like doing so he puts on a hat but mostly backwards since he didn't need to cover his eyes with the had because he normally to always wore Ray-Ban sunglasses. They were reflective hiding his eyes very well. Mostly Jacob would wear shorts, a V-neck shirt with some trainers. If he wasn't half naked without his shirt busy training or swimming in the water. Personality: Jake is a typical guy, cocky and stubborn. He will not budge if he doesn't get his way. He fights for what he believes in but gets jealous very very quickly if someone does something better than him. He isn't as possessive over girls like Erik. He mostly befriends them and never dates them, he hugs them and kisses their cheek as a joke but never to impress. He is an enormous flirt, he loves it and the girls flirt back but he never dates any of them and they know this very strongly. Fatal Flaw: His cockiness is a big flaw, he doesn't have respect for men, god, demi-god, monster or mortal alike. He is cocky and selfish most times and makes fun of gods. He has been turned into many things but his mother always turned him back as she loved him since he was her first born demi-god and child. Demigod Ability/Abilities: Jacob is able to heal himself depending on the wounds. There are only two ways to kill him; decapitation and destruction of the head or by keeping multiple silver daggers in his body because he cannot heal around silver. He recovers from all types of poisons except those created by gods within the hour, god poisons mostly take a week. Scratches and small cuts disappear within seconds, deeper cuts take half an hour. Hobbies/Talents: He loves swimming, snowboarding and practising his flips, cartwheel etc. Pets: He has no pets. Weapons: Jacob has ten daggers, eight hanging on a X-belt over his chest, two attached in pouches on his upper arms. In addition to those weapons he possesses two swords made out of celestrial bronze and iron designed by James N. Leon to kill both demi-gods, mortals and monsters. Other: Unlike his brother he is English. Greek Deity Parent : Hecate, Goddess of Magic. Brief History: Erik was born in Tulsa and had a little brother at the age of two, when he was two and a half he got angry and all sorts of things happen that could only be explained by using magic. His father knew then and send his little brother away and took Erik to Camp Half Blood when he was fifteen and taught him to think himself as a hero, a god amongst others yet he didn't listen to this advise without his dad and always warned everyone not to talk to him when he was with his dad so they knew so he wouldn't loose friends. Once he got to Camp he trained and trained and made his father prouder and prouder. Both had forgotten about Jake and Erik and Jacob still haven't met after both of them stayed at Camp for three years. Physical Appearance : Erik looks like a younger hotter version of Superman. He stands about 6'2'' high and is built muscular unlike his younger brother, Jacob. He fights using strength rather than agility. His skin is tanned slightly from the sun at Camp. His hair is jet black and does a little Superman curl. His eyes was a blue that is bluer than the summer sky. He never does anything with his hair as it's perfect anyway. You mostly find him wearing jeans and tees mostly with some leather armour over it. Personality:Erik is a general nice guy, he is nice to everyone and doesn't whine at all. If he shares a room with a little gay kid he'll befriend him and help him out. The only problem is girls. He is very possessive and gets jealous within seconds. He won't even allow his girlfriends to hug their cousins. His temper is quite short and he can get very violent once he is annoyed. Once annoyed, angry or furious he is unable to control his powers and no-one knows what might happen after. Fatal Flaw: Possessiveness. It annoys many people, even people who he should not annoy. Also the inability to control his powers when he gets angry and his flunking ability to keep calm. Demigod Ability/Abilities: Hekate taught him there were four elements he could choose from and master one, there was; Earth, Water, Fire and Air. Surprisingly he decided to go for air. He is able to manipulate the air, make it warmer, colder, stronger, sharper, anything. At one cost: it uses his aura. An aura is a powerful light around your body which everyone possesses, most have different colours, some uncommon people have fixed colours, others have the colour of a expensive metal like silver and gold which only come along once every three centuries. Erik has an icy white aura he draws his power from but if he uses to much his aura will consume him and burn up and leave nothing but ash behind in a matter of seconds. Hobbies/Talents: He is completely the opposite of his little brother Jake, he likes running, tennis and sword fighting in his free time. Sometimes if he has time he might grab a book or watch a Star Trek movie. Yes, Erik is a total dork. Weapons Erik has two gold and celestrial bronze swords which can only monsters and demi-god but not mortals. Other: Unlike Jake his is American. Brief History: Emma and her brother, Jared were twins. They were born on different days though. Emma was the younger. She was born in the morning of the 15th, Jared on the 14th. Emma was blind from birth but other sense are higher and better than a normal human beings are. She has the same agility, sense and smell as a vampire because of her lack of sight. She is an amazing fighter and barely ever looses except to her brother, Jared. They grew up in England in a great time living very wealthy lives yet never taking things for granted or getting a huge ego. They moved to America when they turned around 14 because their mom knew what they were and wanted to protect them. After moving they lived close to the Camp entrance to save them trouble so they were able to get there quick. They don't leave camp at all and only train because they are in big danger outside of the protective walls of the Camp. Physical Appearance : Emma has no idea what she looks like but has often been told she is extravagant and extraordinary. Her hair is long and golden blond. It has some brown like highlights in them. Her eyes are a startling colour of icy blue which nearly looks blue because of her blindness. She has a very pale skin and rarely wears make-up unless someone will apply it for her with her brother there just incase they try something funny. Personality: Emma is nice and sympathetic but annoyed and angered very quickly especially if it involves her blindness. If anyone would dare help her she'd cut of their hands, that's how annoyed she'd get. She didn't like people like that at all. She is a hard trainer and always feels like she has to prove herself that she is worthy to be a Daughter of Ares. They always think she is weak and slow because she is blind but once you meet her on the battle field you'll die for underestimating her for even a slight second. Fatal Flaw: Blindness. She cannot see where she is going and tries had to paint mental pictures using smells, sounds and touch but she always has trouble in busy places and opening doors. Summer-Only or Year-rounder? : Year-Rounder, never leaves. Demigod Ability/Abilities: Her senses are enhanced because of her lack of sight so she is more sensitive to touch, feeling, smell, sound and taste. Even being blind she inherited Ares battle knowledge and skills. Her battle moves date back centuries and centuries to the time of the gods. She never loses except from her brother, Jared, who has equal skills and has his sight. Hobbies/Talents: She is mostly training to become better so she could fight any monster in the outside world and to prove herself that being blind doesn't matter. Weapons: She has two dark celestrial bronze swords, Ares and Jared named after her father and brother. She loves he father even if he doesn't love her as he is incapable of love, she is not. Brief History: Jared was born a day before his twin sister, Emma, they were best friends and brother and sister. They loved each other more than anything. The had lived there whole lives in Sevenoaks in England. His sister was born blind from birth, Jared was able to see. They moved to America at the age of 14 when both children started showing signs of their demigod abilities. 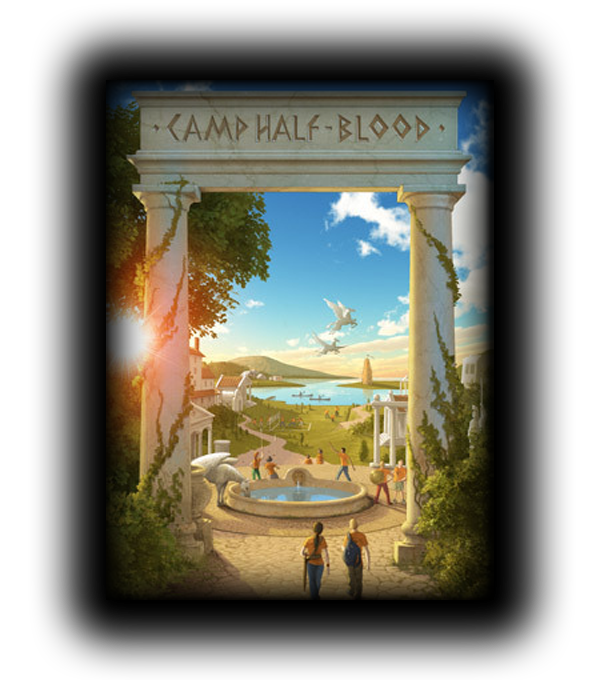 The moved near Camp Half Blood so they could travel quickly and regularly between both their home and the Camp. Jared' mom lives in a huge mansion protected by similar spells to protect the house and her from them. Other than that both Jared and Emma train their mother in hard combat so she is able to protect herself well even without the help of any demigod abilities. Physical Appearance : Jared is tall and slim with undetectable muscles except for on his stomach. He has a six-pack but it isn't rock hard at all, when a girl would lie on them they'd feel like a massage chair. His hair is salt-and-pepper colour unlike Emma' golden hair. His eyes are a shiny moss-like green flashing on his ghost-like skin. He stands around 6 foot. Mostly Jared would wear some shorts and no shirt because his chest is covered in an X belt full of weapons. Personality: Jared is cold, hard and mean. He ignores most if they are not important enough to be noticed. He gets annoyed or angered very quickly, if this involves his sister or someone close to him you just got yourself killed. Literally. He murders anyone who says anything bad about his sister or loved ones. Fatal Flaw: His temper, he doesn't have patients and doesn't know how to deal with anger other than fighting and killing. Demigod Ability/Abilities: Jared' abilities match those of his twin. He is a formidable fighter and his techniques date back centuries. His moves were created even before the rising of the Roman Empire or even the Ancient Pyramids or the Catacombs of Paris. His powers date back to the Age of the Gods when gods still walked the Earth..
Hobbies/Talents: Jared does nothing but train and train. Which of my charries are dating or dibsed? (name here) means the name of the owner of the character. by ... means whoever dibsed the guy was approved by me. Name the said 'crushee', the one my character fancies. No-one at all just now. No, he can only have four right now. For now, both unapproved. Which one do you desire to keep? Okay, I guess. But you cannot RP with James until you've gotten 100 or something posts. Jake? No thank you. I dated a Jake just a couple weeks ago. He was WAAYYYY TOOO DUMB FOR ME. xD I'm good.